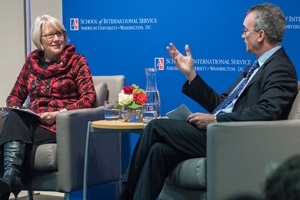 Peace Corps Director Carrie Hessler-Radelet discussed the Peace Corps' modernization efforts with Dean James Goldgeier at a Dean's Discussion on January 15, kicking off a new semester of events at the School of International Service. Faculty, staff, and numerous students-many of whom were returned or aspiring Peace Corps Volunteers and Fellows-filled the Abramson Family Founders Room to learn about how the Peace Corps remains relevant in today's world. Founded by President John F. Kennedy in 1961, the Peace Corps is a volunteer program for Americans run by the U.S. government. Hessler-Radelet is its nineteenth director and has led efforts to modernize the Peace Corps and support the health and safety of volunteers. In particular, the Peace Corps launched a streamlined application process in July. The application is now shorter and applicants can find out admission deadlines more quickly. They can also indicate where they would like to serve, a departure from the past when volunteers were simply assigned a country. Thanks to these reforms, the Peace Corps has seen a seventy percent increase in applications and a ninety percent application completion rate. To date, the Peace Corps has received the highest number of applications in twenty-two years. "The net effect is that it's becoming much more competitive to be in the Peace Corps. We think that's a good thing because the Peace Corps should reflect the very best and brightest of the American people," Hessler-Radelet said. American University has traditionally had a close relationship with the Peace Corps. In 2014, AU was ranked tenth in the Peace Corps' annual list of top Master's International programs. The Master's International (MI) program integrates graduate study at SIS and United States Peace Corps service into a single program. Participants are able to pursue a graduate degree at SIS while serving in the Peace Corps. SIS currently has sixteen MI students, ten of whom are currently serving in Peace Corps. AU was ranked ninth in the Peace Corps annual list of top Paul D. Coverdell Fellows programs. The Paul D. Coverdell Fellows program is a graduate fellowship program that offers financial assistance to Returned Peace Corps Volunteers. SIS Peace Corps Fellows share their Peace Corps experience with the communities they serve in the United States while serving in domestic service sites in community non-profits and schools. SIS currently has thirty-one fellows serving their communities. AU also houses the Peace Corps Community Archive at the AU Library, which collects and exhibits items that document the experiences and impact of individuals who served in the Peace Corps and of individuals and institutions in host countries. Hessler-Radelet emphasized that aspiring volunteers should have "open minds and compassionate hearts." These personal qualities, coupled with the Peace Corps' in-depth training programs, provide volunteers with professional skills to help them succeed both during and after their time of service. Learn more about Peace Corps programs at SIS. Or contact Stephen W. Angelsmith ( sangelsmith@american.edu) for more information.